Note from Editor: Since Howard and I have been putting together the Tribute to Tinplate(tm) series, we have realized that authentic-looking period accessories help "cinch" the overall look of the tinplate era. 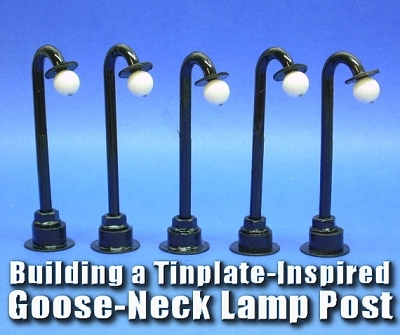 This "goose-neck lamp post" doesn't actually light but, like the straignt-up-and-down lamp posts Howard developed to go wtih the "Lewis Park" tinplate station project, it brings back a whole era. And like most of our other Big Indoor Trains(tm) projects, it costs almost nothing to put together. 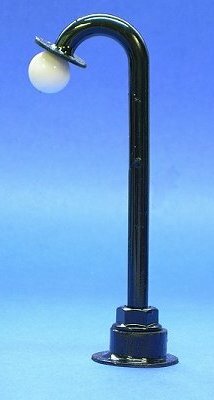 After I made some of the little straight-up-and-down lamp-posts to go with the "Lewis Park" tinplate station project, I thought about modeling another popular lamp-post from the tinplate era. I retained the "given" that the lamp post wouldn't actually light, which freed me to cast about for free or very cheap materials. One day I realized that those cheap plastic hangars have two very suitable curves for such a project. Again, once I had done one, I couldn't help but put together a whole street's worth of them. A cheap plastic coat-hanger, the kind you get ten for a dollar at the "Dollar Store." In the photo to the right, you can see that I have already "sliced and diced it." A flanged nut just big enough to fit over the hanger material. I used a 3/8" nut with a "built-in-washer." Something for the "fat" part of the stand. 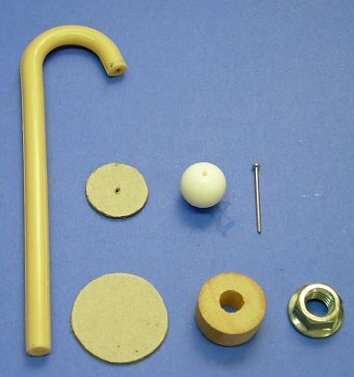 For my "O-gauge tinplate" version I used a broom-stick handle that I sliced into short lengths. Or you could use the "plug" from a hole saw, with a little sanding. For the "flange" base, I built up a couple of layers of thick, noncorrugated cardboard like you get from the back of a writing tablet. A small square or circle of Masonite-type material or thin plywood would work as well. The plan for this task is really just to show you one way to put the pieces together. How your final project looks, or what size it is really depends on what materials you wind up using, and your personal preferences. But if you want to download the plan to get one example, simply click on the graphic to the right. Predrill the base. Drill a hole in the "fat part" of the base that is just big enough to accept the hanger material. Predrill the post tip. Although some of these hangers actually have a hollow place or "air bubble" at the center, you will probably need to pre-drill a hole in the curved end of the hanger piece for the straight pin to go into. It's possible to do that a speed drill and the smallest diameter nail you can find. Try not to drill so deep or wide that the straight pin wobbles when you insert it, though. Glue the post together, except for the bead. Keep an eye on it while it's drying to make sure nothing slips out of place. When that glue is very dry (overnight is best) paint the post all over. Black or dark green are the most typical colors for this sort of lamp. Lionel sometimes used silver as well. When paint is dry, give the lamp post several light coats of the clear, glossy acrylic finish. Give time between coats to dry to touch, so you don't get drips or streaks. Of course once you make one of these and set it on your railroad, you might feel the need to make another five or six. We are definitely interested in seeing how these projects look on your railroad or display village. Please contact us for information about how to send digital photos. Also, if you have a project idea that you would like us to consider, please use let us know. Finally, now that I'm in "retirement," this hobby has become a sort of avocation for me. Several folks have commissioned me to build specific structures or other projects for them. So if you'd like me to bid on a project house for you, or if you have any questions at all, please use the e-mail address on my order page to contact me directly. Building a Vintage "Lithograph" Station Our first "Tribute to Tinplate" article pays tribute to the lithographed stations of seventy-to-ninety years ago. 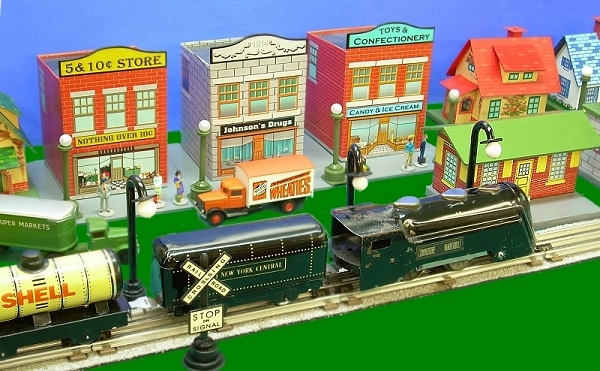 This particular project was inspired by an American Flyer station that was made to go with O gauge trains during the "golden age of toy trains." Free downloadable commercial-grade graphics and plans are available in several scales. Instructions for building this project inexpensively from scrap cardboard are also included (although you could build it from tin if you really wanted to). Log Cabin Building Flat - This "building flat" will dress up a narrow corner of your railroad or village. Note: Big Indoor Trains(tm), Big Train Store(tm) Family Garden Trains(tm), Big Christmas Trains(tm), and Garden Train Store(tm) are trademarks of Breakthrough Communications(tm) (www.btcomm.com). All information, data, text, and illustrations on this web site are Copyright (c) 1999, 2000, 2001, 2002, 2003, 2004, 2005, 2006, 2007, 2008, 2009, 2010, 2011, 2012, 2013 by Paul D. Race. Reuse or republication without prior written permission is specifically forbidden.